This is a map of Hyrule Castle, Castle Town, Hyrule Field,and Lake Hylia from the video game Legend of Zelda Ocarina of Time. This map is far from perfect but I did my best so I hope you like it. 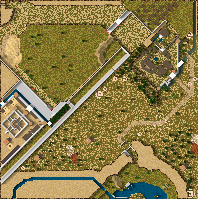 Do to the angles in the actual game and that of Stronghold crusader it made it difficult to perfect this map. It took me two days, and by looking at this map you can probably tell that I am not seasoned in the map making process although I do enjoy it. Please comment and tell me if there is anything I can fix or do to maker it a better map. If you are not a Zelda fan I hope you enjoy it anyway. -When I make maps they are usually unbalanced but feel free to edit it to your own standards.